Norwegian judges have jailed the mass killer Anders Behring Breivik after declaring him sane, yet his extremist ideology and shocking violence continue to raise questions. His murder of 77 unsuspecting people on 22 July last year was the worst outrage for Norway since World War II. It was also the worst far-right attack in Europe since Italy's Bologna railway station bombing of 1980, which killed 85 and wounded hundreds. 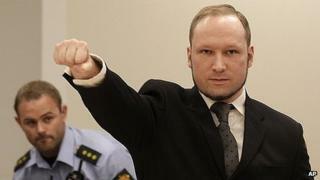 Breivik's calculated acts of political violence took months, even years, of intricate planning. After bombing the Oslo government district he went on a shooting spree at a Labour Party youth camp on Utoeya Island. It was the deadliest mass shooting by a gunman in peacetime. In a country as famously tolerant, integrated and wealthy as Norway, what could have motivated such mass murder? His method was that of a "lone wolf" right-wing terrorist. But he also saw himself as part of an international crusade, a Nordic warrior who could inspire others. First dubbed "leaderless resistance" by a radical right ideologue in 1982, the "lone wolf" tactic has remained a signature of far-right violence for three decades - one whereby the "terrorist cycle" of preparation and execution is undertaken single-handedly. Since Breivik's killing spree, "lone wolf" attacks by right-wing extremists have continued: from a targeted killing of Senegalese traders by a CasaPound activist in Florence last December to the "hate rock" shooting rampage at a Sikh Temple earlier this month by a neo-Nazi singer, Wade Michael Page. Last week in the Czech Republic, police arrested a 29-year-old man stockpiling explosives and weapons, claiming to be directly inspired by Breivik. "Lone wolf" terrorism represents a tiny - if less detectable - fraction of terrorist attacks. It remains difficult to accomplish - that is why Breivik's "manifesto", comprising some three-quarters of a million words, is so dangerous. Beyond the incitement to hatred and violence, Breivik's 2083: A Declaration of European Independence provides a do-it-yourself guide for "lone wolf" terrorism, ranging from a daily bomb-making diary to instructions on how to source materials - both logistical and material - from the dark corners of the internet. The manifesto supersedes all previous terrorist manuals and concludes, allegedly at 12.51 on the day of Breivik's attacks: "If you want something done, then do it yourself." He did so, chillingly and with cold determination. And his manifesto, sent to thousands of fellow far-right "patriots" in the hours before his attacks, is patently intended to inspire copycats. Breivik wants his murders on 22 July 2011 to be considered a form of "terrorist PR" for his manifesto and accompanying online film. He claims the "Knights Templar" clenched fist salute "symbolises strength, honour and defiance against the Marxist tyrants of Europe". From demonising rhetoric to terrorist instruction manual, Breivik's manifesto is a call to arms for right-wing extremists that, in work on similar failed plots in the UK, I have elsewhere dubbed "broadband terrorism". The date 2083 refers to the 200th anniversary of Karl Marx's death, and the 400th of the Battle of Vienna, when a Christian army halted the Ottoman Empire's northward advance in Europe. Breivik's subtitle is lifted from a 2007 essay by fellow Norwegian blogger "Fjordman". Extensive citations - often plagiarised - also refer to other anti-Muslim ideologues and groups, from the Dutch politician Geert Wilders and Steven Yaxley-Lennon's English Defence League to the likes of Jihadwatch and Stop the Islamisation of Nations (SION). In this sense, Breivik's Islamophobic references are less harbingers than reformulated, stock canards that have been trundling around the far- and radical-right for more than a generation. Literally hundreds of references to Breivik's main enemy, "Cultural Marxism", derive from the Christian Right in the US, while its allegedly anti-Judeo-Christian offspring, "multiculturalism" - for which, read "Islamification of Europe" - appears more than 1,100 times across Breivik's 1,513-page manifesto. These and other terms are used to demonise European Muslims on well-networked internet sites; theirs is the language of civilisational war, not democratic politics. His activities, of course, were not limited to online hate. He was a dues-paying member of Norway's populist right-wing Progress party for some five years until 2004. During that time he seems to have visited Bradford in northern England shortly after riots there in 2001, which further convinced him of the allegedly evil and "genocidal" nature of multiculturalism. The online multi-player game World of Warcraft also became a big part of his life - sometimes he played it for as many as 16 hours a day. Players adopt fantasy roles and fight battles to earn rewards. By 2009, Breivik was using Facebook to communicate with members of the recently formed street movement the English Defence League, and later claimed to have hundreds of EDL Facebook friends. By 2010, Breivik was apparently in contact with at least some of the EDL leadership, and attended at least one demonstration that year. He also visited London to welcome fellow "counter-jihadist" Geert Wilders. While very different, these networks continue to agree that - again citing 2083 - "multiculturalism is an anti-European hate ideology". Breivik offers a clear instance of "Christianism" - the use of travestied Christian doctrines for the advancement of violent and revolutionary views. That is no reason for anyone to demonise more than a billion worshippers of Jesus Christ. By the same token, Islamism remains a political perversion of a Muslim faith shared by a billion souls. Such anti-liberal doctrines can be - and have been - defeated by robust discussion and debate.